There are many types of knife sharpeners out there to choose from. You can purchase an electrical or manual sharpener like most, or you can try a bit of a challenge that offers you some wonderful results. Whetstone knife sharpeners are perhaps the most ideal type of knife sharpeners. While they are different from their counterparts, they are still a wonderful solution for individuals that want to sharpen their knives the old fashioned way and still get great results. One whetstone product that has been gaining in popularity is the Whetstone Cutlery Two-Sided Whetstone Stone. Whetstone Cutlery is a U.S. producer of Whetstone and other knife sharpening products. In addition to these items, the company also products its own line of kitchen and specialty knives for both home and non-home use. Whetstone products can also be purchased anywhere online or at local hardware and kitchen stores. For some, the whetstone is the perfect type of tool to sharpen knives. While there is a bit of a difficulty with the learning process, it is still manageable and easy to get down after a bit of practice. 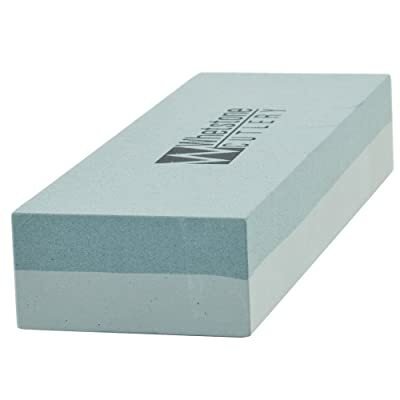 This whetstone product is a 2-sided rectangular stone block, each of which has a different grit level for different sharpening levels. This type of system is ideal for individuals that have a varied collection of kitchen knives. The first side of the block, the darker green side, is 400 grit. With a grit as fine as 400, you can expect the material to be dense. This leads to a finer finish on the knifes edge. However, while a low grit level leaves a finer finish, it does require users to swipe the knife more than once or twice to get the correct sharpness. The other grit level on the other side of the block is 1000 grit. At this level, you can expect the material to be extremely dense, thus creating a very fine finish on the blade. Users usually begin at the 400 level for a good finish, and then progress to sharpening at the 1000 grit level to find tune the blade. Finally, while this product takes a bit of learning, it is well worth it. When you submerge the stone in warm water and sharpen your knife, you can expect to get extremely precise and worthwhile results. You can also choose the angle which you want to sharpen at, increasing the chances that you are getting an exact finish. While there are many advantages, there are also a few things to be aware of. This whetstone is highly recommended for individuals that are looking for one of the best methods to sharpening knives. While it does require a bit of practice, the effort is well worth it. Whetstone is one of those sharpening styles that truly gives your knife a sharpness that is nearly identical to the day you took your knife out of the box.